Children will learn to count and read the numbers from 10 to 20. Warm Up - Before to math lab activity. Ask students to say loudly from 1 to 9 numbers.Repeat this warm up activity to more than 5 times. 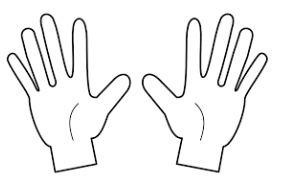 Fun Activity: Show 10 fingers like in the picture.Also, ask the childrens to show and count the fingers. 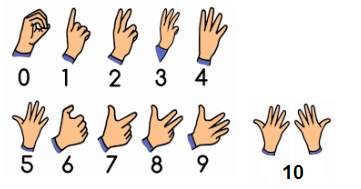 How to Count the Numbers in Fingers ? Let us tie 10 pencils into a bundle.Now, we have 1 bundle of ten. After introducing the number 10, as explained before, take 10 pencils and tie them in a bundle.Say, this is 1 bundle of 10. Retie the bundle of 10 for each successive number all over again. This will help in developing the concept of ones and tens without introducing the terminology.